A simple tune with a powerful message. I recall hearing it sung so passionately after the tragedy of 9/11. Megume Suzuki was a young student from Japan who was studying in Adelaide. She tragically lost her life in 2001. I wrote the first tune in memory of her in January 2002. The second tune is a traditional Japanese tune. This is my favourite tune on the album. 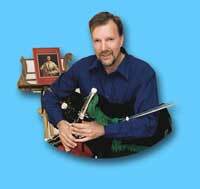 I play it in the key of B flat, which involves a lot of key work on the chanter. I learnt it originally from Paul Chester and have added my own variations. I play it in the style of a slow air. Thanks Paul. 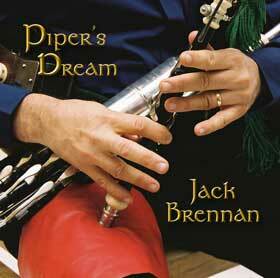 The first tune I heard played by Sean Potts, a Dublin piper. 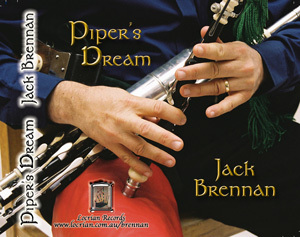 The second tune I have always played, and the third tune is a version by the famous Irish American piper Patsy Touhey. I was asked to play this fantastic tune at a wedding many years ago. Originally written for oboe, the tune fits nicely on the pipes. I played this beautiful melody at the funeral of Joe Ryan, a good friend, who died tragically in August 2004. The tune was composed by a harpist in the 1700s, with the words for 'Danny Boy' being written in the 1930s. A friend gave me this melody on a tape and I just loved it. Usually played as a classical guitar piece, I have adapted it to suit the pipes and added a harmony line. A beautiful tune I first heard played on an Enya album. The title has a strong connection to the melody. 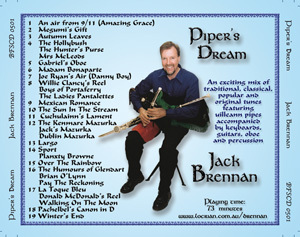 Composed by Bill Whelan, it is one of the great tunes that came out of River Dance. The keyboards and pipes go together in this tune like peaches and cream. I composed the first two mazurkas, however I am not sure where the third tune comes from. Mazurkas were originally a Polish traditional tune, but the Irish have many of their own. I was sitting in a Hotel in the South Australian town of Tanunda when I heard this tune played over the sound system. I felt it would be a good tune to play on the uilleann pipes. The first jig was composed by Paeder O'Riada. The second jig was composed by Turloch O'Carolan, the famous blind Irish harpist. One of the greatest melodies from the last century, I have heard it described as 'The greatest melody ever written'. It's hard to disagree. Three jigs that I like to play and have played for years. I believe the first tune is a French Canadian tune. The other two tunes are Scottish reels with a lovely lilt and twist. One of the greatest tunes from the Baroque Period. It fits nicely on the uilleann pipes. I start the tune with a drone, which sets a good foundation to build on. 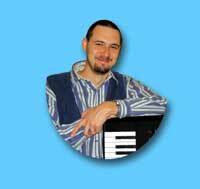 Another of my favourite tunes, it was composed by Irish composer Shaun Davey.